@ AFC AJAX | Champions 2019-20 - For the Cup! Strong start to the season, basically finish the 2 legged match in one game thanks to the 3-0 win, although I'd still play some key players in the second leg just to make sure you see it out. Looks like you dominated all over with that possession and the amount of shots you attempted is ridiculous! Great start to the season, that match could have been 5-0 easily it seems. The manager hit the head with his thoughts on the second match. They will come out aggressive at home and go all out, which should leave plenty of attacking room for you. I always update the stadium names, at least for all UEFA teams. But I discovered only yesterday that the official (non-commercial) name of Sturm Graz stadium is Lubenauer Stadion. Fantastic win to advance. Some surprising stats, 14 of 16 shots on target and Sturm had 22 fouls! I wonder if Neres wanted to take the penalty to secure his hattrick? It is becoming obvious that this World Class level is rapidly becoming too easy. As of the next game, we go one level up (Legendary) and one minute per half shorter (9 minutes). Maybe check out the Operation Sports sliders too. I’m scoring a lot right now as well and I’m on Legendary so I’m thinking instead of going up I’ll just try some new sliders. Done that: I've basically gone back to my FIFA 18 settings: Legendary, sliders at 40/60 in AI's favour. When even that would become to easy, we first shorten lengths per half and if that won't do, the final step is to go to Ultimate-level. So, there's still room for improvement, though FIFA games generally do not have a steep learning curve. Don’t forget, the game just officially launched for a lot of people today. We’ll probably be getting the first patch soon....so who knows where gameplay will go after that. In other news, those injuries are really starting to pile up. 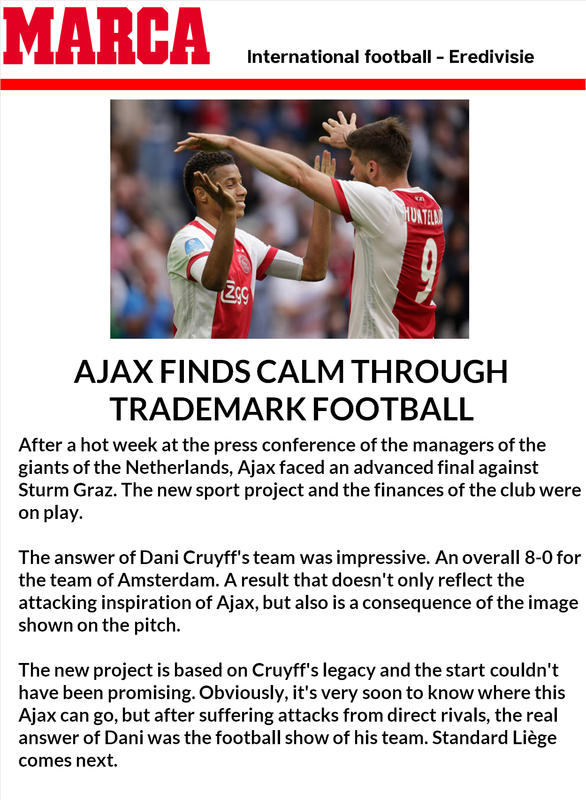 Ajax is going to need all the depth they have if they want a successful campaign. Good point... again. With FIFA 18 I had the sense (maybe I'm wrong) that these gameplay patches actually made the game slightly easier. I hope that won't be the case here. Ajax and PSV are supposed to dominate in the domestic league, but ought be equal to a little less than big opponents in Europe. So the customized Legendary level (as it currently is) feels good in that aspect.